Because of the size and extensive remains at Sagalassos I have had to divide the images into three "sections." This section features the very well–preserved (and magnificently reconstructed remains) from the area of the Upper Agora, including: the (now functioning!!) 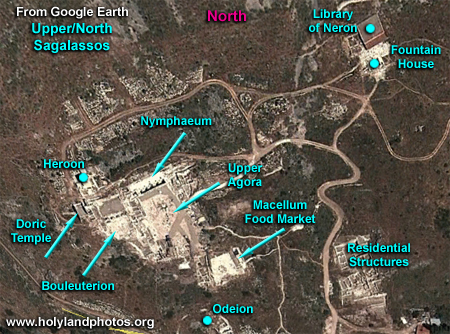 Nymphaeum, the Agora and its monuments, the Bouleouterian, the Heroon, the Doric Temple and the Macaellum. The other section of the remains in "north" Sagalassos features images of the well–preserved "Fountain House," the Library of Neron, and the mysterious Theater. 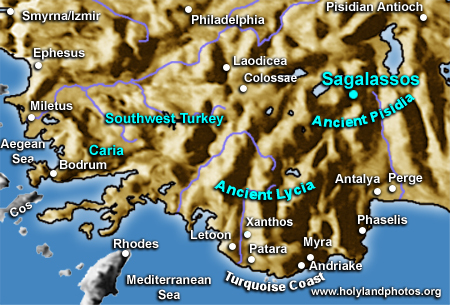 There will also be a section on Lower (southern) Sagalassos. Sagalassos has been under excavation since 1990 by a Belgian team led by Marc Waelkens of the Catholic University of Leuven. Because of its remoteness it is very well preserved and Waelkens' team has made some outstanding discoveries and has been very diligent in the preservation and restoration of the site.